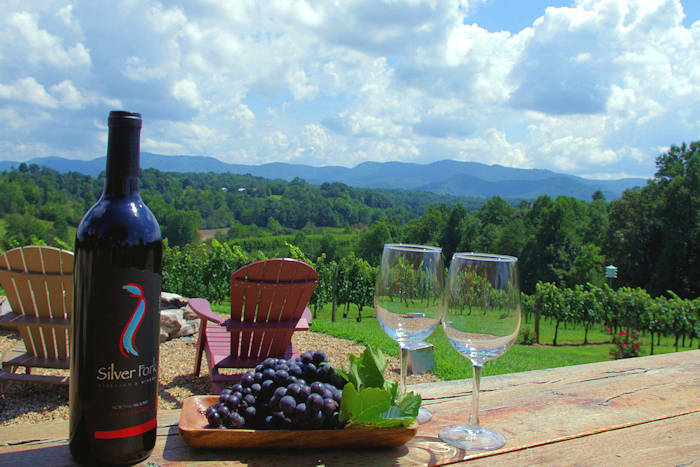 NPR calls Asheville the "Napa Valley of Beer!" Our beer scene features an amazing selection of bars, brewpubs, micro craft breweries, cideries and restaurants. Sample hundreds of local brews from 50+ western North Carolina mountain breweries. Asheville, per capita, has one of the highest rates of craft brew consumption in the Southeast. Accolades include being named Beer City USA for four years in a row, Forbes Travel Guide 5 Beer Cities To Hit This Summer and CNN 8 Best Beer Towns in the USA. Here are our top picks for beer in the Asheville area. Many are located downtown within walking distance of each other (see our South Slope Brewing District Walking Tour). 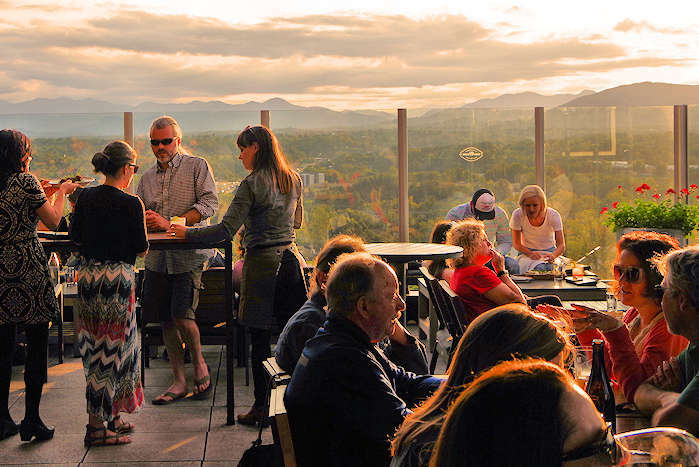 Also see the best downtown Asheville bars for wine and cocktails. (20 South Spruce St, downtown Asheville) A lively, fun spot thanks to an extensive renovation of an historic building by Pack Square Park, in front of City Hall. They carefully pair beer styles with food and rotate 30+ local, national and international craft beers to offer the best selection available. Park-side outdoor dining area too! (147 Coxe Avenue, Asheville) Wicked Weed opened their nearby barrel house and sour tap room in the South Slope in late 2014 to store 1,000+ wine and bourbon barrels. This tasting room has 16 taps for sour and wild beer. Open daily. Read more about the South Slope Brewing District. (32 Banks Avenue, Asheville, South Slope) Catawba opened its big, seven-barrel specialty brewery and tasting room downtown in 2015. They also have a place in Biltmore Village. They have a dozen of their brews on tap. Open every day. Their main production facility is in Morganton. 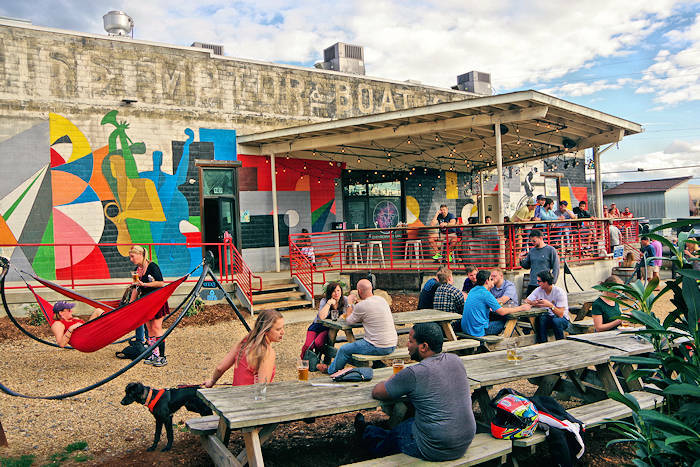 (37 Paynes Way, West Asheville) Located in a warehouse turned art studios in the River Arts District, this local's favorite neighborhood brewery serves classic styles paired with a big variety of food trucks. Open every day, 12 Noon-10 PM. (92 Patton Avenue, downtown Asheville) Recognized as one of the best beer bars in the world, they tap 1,000+ different beers a year. The upstairs bar features American Craft Beers with 20 rotating tap lines. Take the stairs down to the basement level to the Belgian Bar (50 Commerce St.) with 16 Belgian, European and rare beers on draught. An extensive bottle list will impress beer-snobs and novices alike. (1288 Charlotte Hwy, Fairview) Located 15 minutes from downtown Asheville, this dog friendly taproom is housed in two retired train cars surrounded by a deck with mountain views and outdoor activities. Their flavorful brews with local ingredients include the Honey Fig Saison, Banana Wheat, Chimperial DIPA and SOB (South Of the Border) Porter. Open Thursday-Monday afternoons. 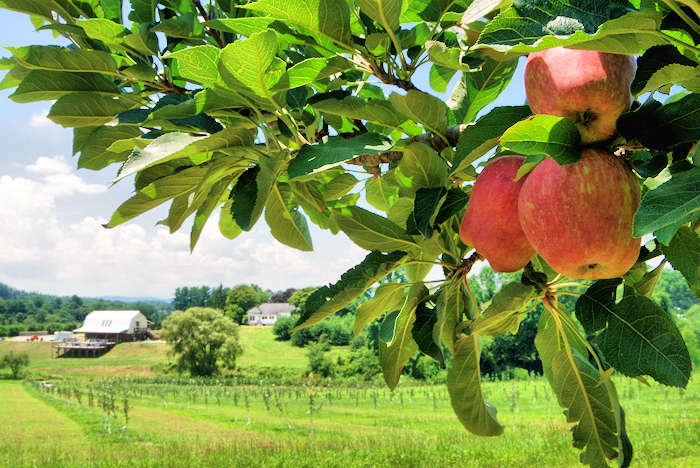 Located just two miles south of downtown is the historic village outside the entrance of Biltmore Estate. It's becoming the next hot spot for breweries - and it's usually easier to find parking! Check out Catawba Brewing (63 Brook Street), French Broad Brewery (101 Fairview Road) and Hi-Wire Big Top (2 Huntsman Place). Sample 50+ beers, ciders and wines at Pour Taproom (2 Hendersonville Road). Read more about Biltmore Village. Innovation Brewing (414 West Main, Sylva) They create traditional styles of ale and ol’ standbys, along with experimentation with a variety of fun and fresh ingredients for unique styles. Nearby is Balsam Falls on the Jackson County Ale Trail. Southern Appalachian Brewery (822 Locust, Hendersonville) They specialize in making small batches of craft beer. Tasting Room downtown frequently has live music. Sanctuary Brewing Company (147 First Avenue East, Hendersonville) in downtown is a place for craft beer enthusiasts and animal lovers for a strong sense of community and environmental responsibility. Try their farmhouse ales, American stouts and West Coast IPAs. Nantahala Brewing Company (61 Depot St, Bryson City) From their Flagship, Noon Day IPA, to their epic adventure-inspired Trail Magic Ale™ Series, their brews have ties to the rich history of brewing in the Great Smoky Mountains. BearWaters Brewing (130 Frazier St #7, Waynesville) Their full-service Tap Room features 10 signature and rotating beers on tap. Start with a sampling flight paddle. Frog Level Brewing Company (56 Commerce Street, Waynesville) Taste some of the smoothest craft beer to touch your tongue, from the bite of their IPA to the smokiness of their Scotch Ale. Fonta Flora Brewery (317 North Green, Morganton) This microbrewery is striving to create a totally unique North Carolina/Appalachian style of beer. By utilizing local grains and foraging the countryside for wild flora, they are taking brewing back to its agricultural roots. Catawba Brewing (212 South Green Street, Morganton) This family-owned, 15-year old craft beer maker with a great location for live music while sampling brews. They opened a downtown Asheville brewery in 2015. Oskar Blues Brewery (342 Mountain Industrial Drive, Brevard) Oskar Blues' east coast brewery opened in late 2012 and produces 56,000 barrels of beer a year. Take a tour any day of the week. Some specialty draft ales are only available at the brewery tasting room, which includes a restaurant and music venue. See our Oskar Blues Brewery Guide. Brevard Brewing Company (63 East Main Street, Brevard) They specialize in lagers, cold-fermented and aged over twice as long as ales. Pisgah Brewing Company (150 Eastside Drive, Black Mountain) Located in Black Mountain about 10 miles east of Asheville, they specialize in brewing hand-crafted certified organic beer. Try the Pisgah Solstice, a Belgian-style ale, or the darkest ale, the rich and smooth Pisgah Porter.